When Thea takes the job as Officer in Charge of the Thursday Island police station, she has no idea that her desire to start anew and return to her mother’s Islander roots will be the greatest challenge of her life. Arriving with visions of enjoying a laid back, idyllic island lifestyle, What Thea finds instead is a close-knit community divided by a brutal crime. Rich in colour, texture and culture, My Island Homicide will take readers on a tropical adventure bursting with characters, crimes to be solved, courtroom drama, island humour, and romance. My Island Homicide is three stories in, a murder mystery, a love story, and an introduction to a very different way of life, on Thursday Island, a multi-cultural community in the Torres Strait. TI, as it is referred to, is presented as a very beautiful place where life is not always as beautiful or relaxed as it appears. 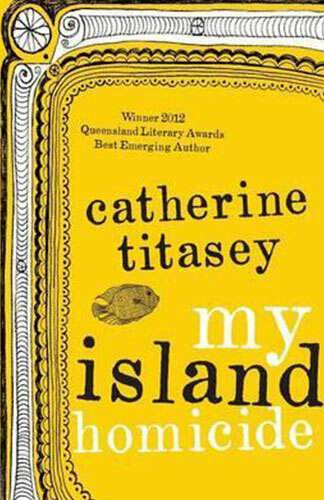 The author, Catherine Titasey, was born in Sydney and trained as a solicitor. She now lives on TI and is married to a local fisherman. The island and its way of life, especially the food, are very much a feature of this book and certainly made me want to visit. Are there any more spunky fishermen like Jonah, (the gorgeous love interest), wandering along the foreshore? We meet Ebithea Dari-Jones on her first day as police officer-in-charge on TI as she struggles to come to grips with her new life. She is immediately challenged by the concept of maydh or black magic. Thea has never been to TI although her mother originally comes from there, so she experiences a steep learning curve. She also comes up against broken English, the language many locals speak, and by the end of the book is able to think in that language. TI is very much a multi-cultural community and the relationship between the different races and the many mixed race people is fascinating. The mixed marriages play their part as do the white people in various positions of authority. Add corruption and murder, not to mention the weather, to the mix and you have one amazing book. With so much happening it would be fair to say that the homicide is only one part of the story and chapters go by without it being mentioned. However this is a book fascinating on so many levels and a most enjoyable read.